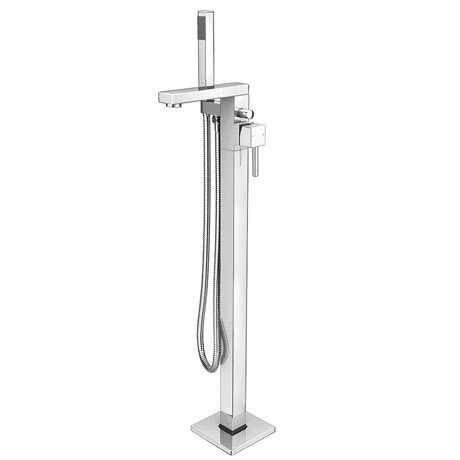 The Prime freestanding bath shower mixer tap features cutting edge design and is manufactured from solid brass with a stylish chrome finish. Suitable for system pressures of 1.0 Bar or greater. Features a modern angular design and complemented by a single lever handle that gives finger tip control of the temperature and flow of water. Nice unit but strange connections. A very nice looking unit for any free standing bath.The strange thing is that the water connections are 3/4 BSP males so you will need some adaptors to connect to 15mm or 22mm pipe connectors. Good shower pattern for a small head and easy to use. I brought this item and love the design but the head inside the nozzel sprays the water. If you have a free standing bath you need a directional flow pouring - like one that comes out of the tap or water gun but larger.This method reduces the amount of water left around the edge of the floor standing bath.